Imagine a sports team in New York in 2001 with some sort of jihadist or mujahideen based name and the equivalent mujahideen imagery to what we see here. There is no way that they would keep using that name. The "Crusaders" was always a somewhat problematic name, but up until now it might have been fair to say that it didn't matter, because the crusades were ancient history and nothing to do with our country. We can't say that now. Before anyone complains about the 9/11 comparison, the loss of life per percentage of national population is similar and unlike 9/11 and the London terrorist bombings of 2005 (52 killed - not including the 4 bombers), the Christchurch shooter was aiming at a specific group of people, the same group that were the targeted by the crusades. It feels like lost heritage to me. 20 years of associating crusaders name to Canterbury ruby, and yelling go Crusaders. Safe new name hopefully “Canterbury Rugby” as feel it’s inevitable. Stuff poll had 65% felt it was PC gone mad. Don’t know what regions poll taken over. alexx:......the Christchurch shooter was aiming at a specific group of people, the same group that were the targeted by the crusades. Don't forget the ANZAC's, they targeted the same group of people, so that's now a dirty word that we should surely be ashamed of. rugrat: It feels like lost heritage to me. 20 years is not heritage. Not even close. Really? You are comparing something that is part of NZ history with something that is not part of NZ history. No New Zealanders were involved in the Crusades. World War I was not a war of religious beliefs. The ANZAC's in WW1 were at war with Germany, the Austro-Hungarian Empire, the Ottoman Empire and others generally known as the "Central Powers". There was no specific war against Islamic nations or Muslim people. The ANZAC's in WW2 were at war with the AXIS powers, which included very few Muslim nations and others (Albania) were considered members of the Allies. No, the ANZAC's did not target the same group of people. If you're going to take it to the extreme, let's rename Christchurch.. surely calling the entire city the church of christ is offensive to anyone who's not a christian? I'm curious how many of you who are outraged at this are actually Cantabrians? Or are you just generally angry because this must surely be all those pesky alt-left\socialist\SJW types causing political correctness to go mad again? Personally the name doesn't bother me, and personally I wouldn't call for them to change it, but I can see how it might bother some. 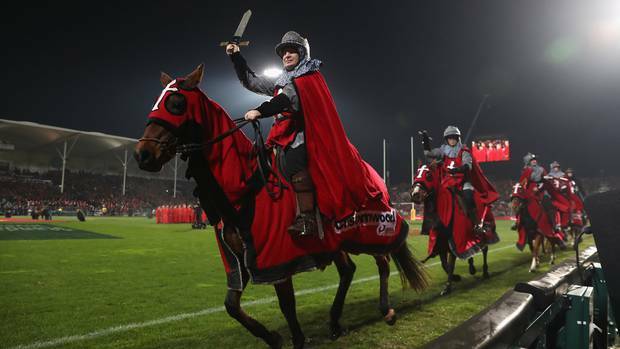 I don't see any issue with the Crusaders reaching out to the Muslim community (and wider community) and consulting with them on whether they should change it. Im ok with a name change but I DONT want it changed for PR PC issues. Only if the Muslin community have an issue. I feel really really down over this, I dont know why, but I will be super farked off if this name change bizo is based around PC/PR/Stuff comments/Facebook issues. I saw some pages "no page here" or whatever it was, disappear. Its unfortunately got a bit wild. I didn't realise ANZACs were also a problem, in that case changing crusaders name would open a big can of worms. Could they just change their mascots and cheerleaders to some other caped crusader like the flash or batman or something - I mean in the past KFC was Kentucky Fried Chicken and now fried is removed from any reference and KFC happily exists. It's become very snippy, personal and attacky, more than usual. I get why to a degree. Tensions are high and people are looking for a channel for their unprocessed and understandably overflowing emotions. I actually think it will get much worse. I'd favour a temporary lock to the politics and off-topic sections of the forums. I had hoped for a more positive focus to our community, as it was during the quakes where NZ came together as one. It doesn't feel like this, this time it feels like the attacks have caused the division that was likely a hoped upon side effect for the gunman. I've contributed to that, not intentionally, but I've decided to stop for a bit and take a break. I certainly did not think of ANZACs as an issue but I can see now how this can really boil over, and open a huge can of worms should we move on Crusaders and then what else do you want changed! I have no idea what happened to the "other" thread either maybe something bad was invoked but maybe that was a bit overboard overall. I now have a change of heart about - if you change one thing you might have to change everything. I'm not sure there is a problem with the name Christchurch ... it's not an attack on anything, it's like there's a suburb in Dunedin called Maori Hill! I'm not an expert, but I don't think that Jesus (Christ) has the same negative connotations for Muslim people as the Crusades do.